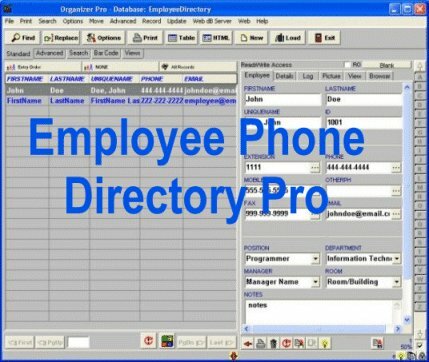 Employee Phone Directory Pro 2.9 Free Download - Database management software that helps you to manage employee directories. Employee Phone Directory Pro for Windows: database management software that helps you to organize and manage your company employee phone directories. Databases included: Employees database (manage employee phone directory), Log database (track out-of-office hours), Events (manage employee events), Contacts (organize company emergency and important contacts). Print employee directories, employee phone lists, employee email lists. Search employee database by any field, sort records by any database field, send emails to all or selected records, generate html reports. Free web database browser included (share your databases over the web, intranet). For the power user, Organizer affords the simplicity of wizards that make it easy to set up and use email list management solutions that you create. You can modify databases included in the system. Statement: First, please download the orginal installation package by clicking the download link. Of course you may also download it from the publisher's website. Using Employee Phone Directory Pro crack, key, patch, serial number, registration code, keygen is illegal. The download file hosted at publisher website. We do not provide any download link points to Rapidshare, Hotfile, Depositfiles, Mediafire, Filefactory, etc. or obtained from file sharing programs such as Limewire, Kazaa, Imesh, Ares, BearShare, BitTorrent, WinMX etc. Software piracy is theft. If you like Employee Phone Directory Pro please buy it.